Nothing quite like a fish right out of the lake! Whether you’re dealing with a tricky Y-bone while carving up a northern pike or creating large fillets from your latest catch of bass, walleye, or salmon, you’ll find your entire fishing trip experience becomes much more enjoyable when you have a truly quality knife that will help you cut up the fish and de-bone those fillets quickly, easily, and accurately. There is a huge difference between a good knife and just an average knife, much less looking at the quality between a great fillet knife and a good one. In other words, if you’re looking for a great gift for the angler or anglers in your family, a very high quality fillet knife is always a safe way to go. Throw in a high quality sharpening stone so he or she has the tools to keep them in tip-top shape and you will have someone excited to get back out in the lake again! If you don’t know where to start, don’t worry: this article will fill you in on all the information you need to make a smart and informed decision! And we even updated this list for 2019! There’s no question of the importance of having a really good fillet knife. The difference between a dull or unreliable blade and having one of the best fillet knives available for use will be really easy to notice. Better cuts not only make cleaning and de-boning the fish easier, but makes it faster as well as less likely that you will cut or injure yourself. This is a great combination and when you find yourself able to eat more fish with less bones, that makes the entire meal much easier to enjoy. A really good knife, a little knowledge, and a little experience go a long way in helping you learn how to fillet a fish quickly, fully, and effectively. No mater how good you are, if you don’t have a really good fillet knife that holds an edge, you’re going to have a rough time. With that in mind, read on to take a look for our best picks for top fillet knives – the type that work as well in the wild off the lake as they do in the kitchen. Keeping the list down to just a touch over 10 choices when it comes to great fillet knives was hard enough because honestly, there are so many great choices. Even among the best of the best one had to come out on top, and it was hard to argue with the Morakniv fillet knife featuring a Sandvik stainless steel blade. One of the highest ranked fillet blades on all of Amazon, this is a knife that has received hundreds upon hundreds of outstanding reviews from experienced anglers who have tested it through and through. This fillet knife has a patterned handle designed to be high friction to give you a great grip so it won’t slip out of your hand. The blade comes from a company (Sandvik) that has produced fine knives out of Sweden since the 1890s. 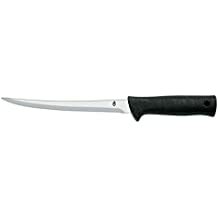 This particular premium fillet knife features blades that come in two sizes: 3.5 inches for the short one, or 6.1 inches. Many anglers have both, giving them a versatility that helps to insure they always have the right Morakniv fillet knife for the job. 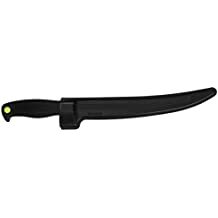 The slotted plastic sheath might not be fancy or give the same aesthetic appearance as a custom leather knife sheath, but this is functional, can be attached to a belt loop or clipped on to the jeans. This lets you carry around a knife that is razor sharp, extremely hard, and can resist corrosion and damage. At a mere 3.5 ounces this knife is lightweight, while providing outstanding cutting ability. This is a knife that likes to keep its edge, so even minimal effort to upkeep will make a huge difference. This is a great fillet knife, and one of the best you’ll find on the open market. You can buy with confidence knowing you, or the family outdoorsman, will love it. Considering they are one of the truly giant names in the fishing industry, it should come as no surprise to experienced anglers that the Rapala name ends up making this list. A long standing standard bearer in the industry, the Rapala name and quality are synonymous – you know you’re getting premium level materials here. The Fish’n Fillet knife from Rapala comes in several different sizes though the 7.5″ in particular has stuck out as a truly premium option that delivers the absolute best in craftsmanship and functionality that makes it stick out a touch above and beyond even the two other Rapala based Fillet knives on this list. This seven and a half inch blade is enough to make even deep cuts while having the proper construction and high grade steel to make even the most delicate of cuts when removing the ribs from the fillet itself. This knife comes with a basic starting sheath that is fully functional and works as a basic knife holder (you can always get a more customized or hand leather carved option if you want some incredible aesthetic to show off later) as well as a single stage sharpener that will help you make sure this knife stays sharp. A favorite among both beginner and experienced anglers alike, this is one of the highest rated fillet knives you will find on Amazon and anywhere else. The only potential drawback tends to be that some people prefer to go with their own custom sheath as opposed to the one it comes with, but this is a personal taste issue only. When that’s your biggest issue with a piece of fishing equipment, you’re doing pretty great. Some knives just really stick out compared to others. 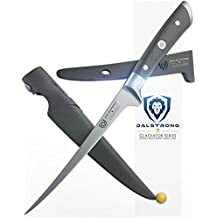 DALSTRONG’s Gladiator series hits this elite place as their flexible and reliable fillet knives made from solid German steel really hit home with the discerning angler and outdoor enthusiast. This is the seven inch fillet knife, which not only comes with two sheathes and the aforementioned excellent German steel but it has been designed to be ideal for de-boning, de-scaling, skinning, and full filleting. Whatever you’re looking to do when cleaning and cutting up the fish, DALSTRONG’s Gladiator Filet Knives are perfect. This blade is efficient, very flexible, and designed to be maneuverable so you can change angles as needed to get those especially tricky ribs out so you’re not pulling them out of your teeth after cooking later. Precisely tempered with a full tang, this knife manages to stay razor sharp and is even hand polished at a remarkable 18 degrees per side. This helps create the high level of quality that discerning and picky anglers expect from their knives. This is a truly premium knife with the main complaint being the relatively high price compared to other models, however this is an aware winning design and a knife that is built for use, beauty, and for being the complete package. That’s a hard combination to top. Tripled-riveted, the black pakkawood handle has a comfortable easy grip. It is laminated, looks aesthetically stunning, and brings together the best Europe has to offer. Wood from Spain, blade from Germany, this is one where even the best parts come together to make a greater whole. Add in extreme durability, a mirror polished finish, easy-cleaning set up, and the lifetime warranty that comes with a 100% satisfaction guarantee. This knife comes with an official polishing cloth, traveling sheath, and even a full color guide detailing everything you need to know about this top rated fillet knife. If you like premium outdoor fishing gear, you won’t be disappointed with this choice. Made with a simple but effective design, this is the top rated budget fillet knife on the list. Made in China and coming in 7 or 9 inch blade options, these fillet knives from Kershaw are designed to offer premium cutting and functionality without forcing anglers to pay premium prices, leaving more room in the budget for that new lure or rod that will help them bring in that elusive trophy catch. Featuring a blade made from quality steel and a co-polymer handle with a satin finish, the two blade options give anglers plenty to love while a mere 3-5 ounces of weight means these knives are very easy to hold and use. This particular model comes with an inexpensive but sturdy plastic sheath. This is a great fillet knife for an angler on a budget. The cut tends to be very solid, and this is a knife that definitely gives you your money’s worth and is an extremely good value at budget pricing because the quality is still there. The biggest complaints? Some customers have reported needing to really stay on top of sharpening the knife to keep it functioning and for consistently large fish like lake trout or large northern pike some anglers say the knife blade is almost “too flexible” making it hard to cut through especially thick sections of a fish. The Columbia River Knife & Tool (CRKT) Clark Fork Fillet Knife is our highest rated folding fillet knife (yes, that is a thing now for all you old school folks), and one that has gained a lot of attention because of its ability to bring quality to a folding knife design – something that you don’t see all too often from a fillet knife. The CRKT Clark Fillet knife features a 6 inch blade and weighs a mere four ounces. The entire folding knife is a touch over 11 inches. The blade locks securely into place when it’s time to cut through the day’s catch and easily folded and locked back into its fitted space in the handle once the work is done. This versatility is part of the reason this particular model of knife has become so popular among anglers of all experience levels. This knife boasts and innovative tail lock safety bar design that sets it apart as one of the top rated folding models out there. A reinforced nylon sheath is the perfect belt attachment to hold this knife, and this is an excellent option for individuals who need something cheap, effective, and space saving. The second of three Rapala based fillet knives for fishermen to appear on this list, the soft grip style lives up to its name offering a very comfortable grip that is easy on the fingers and palms while helping ensure a strong hold that will help you keep the knife firmly held even during wet and slippery conditions. Many satisfied buyers have commented on how impressed they are with the quality of the grip, especially for the low price of this Rapala fillet knife. Aside from the obviously well-thought of featured grip, the blade itself is made with a flexible stainless steel blade. This means sharp and smooth cutting, maximum control, and no worries because of a textured handle that seems molded right into your grip. Add in a black sheath that can easily be attached to the belt for handy transport and the overall value of this purchase becomes even better. A single-stage sharpener is also included to allow for easy sharpening of the blade to make sure your knife is in tip-top condition during the entire time. 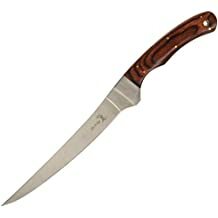 While the 4 inch version seems to get the most feedback on Amazon, this isn’t the only option available so if you’re looking for a larger knife, don’t worry you have options. Find the one that is right for you before your next lake or river outing! Buck Knives is a name that has built an incredible reputation over the years, and for good reason. Their dedication to incredible quality has been backed up by a lifetime warranty for all of their products for years, which is pretty good motivation for making sure that customers don’t find a reason to cash in on that. This inexpensive yet quality folding fishing fillet knife is another example of innovative design meeting outstanding quality to create the type of knife that many anglers will absolutely love. 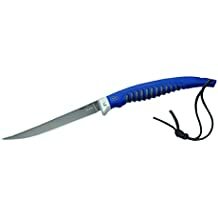 The blue handle sticks out, and folded up this knife takes up very little space and can easily be attached to a belt or a clip. At 6.5 inches, this flexible stainless steel blade also features a titanium coating that helps protect it from rust or basic wear and damage from water, salt, and time. The anti-slip grip and safety guard means you don’t have to worry about losing control. This knife has garnered hundreds of positive reviews online while providing outstanding work as a top notch fillet knife that gets the job done whether for sunfish, trout, bass, walleye, or even northern pike. If you’re looking at folding fillet knife options you can certainly do worse than going with the trusted Rapala brand to get a knife that will work for you instead of making you work a lot harder on making the right cut. An inexpensive options for individuals who need a decent fillet knife but don’t have the money to spend on a premium model, the Gerber Gator fillet knife is an outstanding cheap knife option that can provide a usable knife that doesn’t bust the budget. There are many cheap fillet knives out there, but all to many of the knives in this price range are terrible with dull blades that break and even worse handles. Fortunately for you, none of those knives will ever make one of our top rated lists. 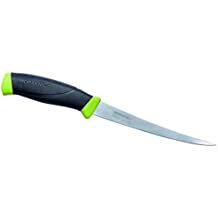 The Gerber Gator fillet knife might not cost much, but the quality is still there with a textured handle to give excellent wet and dry grip in addition to quality cutting power. The full tang fillet blade is slightly over 7 inches long while the overall length of the knife is a shade over 12 inches total. Tie that all together at a weight of only 4.4 ounces, and it’s not hard to see why this knife is having success as a quality inexpensive option. There’s a lot to like about the Gerber Gator as a good budget fillet knife. While it might not compete with the premium names on this list, it does stick out as an outstanding option when cost is a big deal. Featuring a beautiful looking wood handle to give it an outstanding aesthetic, this Elk Ridge fillet knife is a fantastic low cost budget-friendly option if you really need a new fillet knife but need to keep it as cheap as possible without worrying about things like the blade snapping. 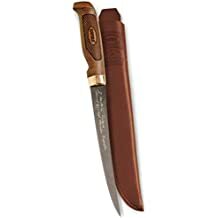 At an average of just a touch over $10, this field tested fillet knife is made from solid inexpensive materials, and it’s 440 stainless steel blade can be sharpened to quite a point. Included with the knife is a nylon sheath for easy storage and carrying. This leads to a solid looking knife that can be a great tool for turning the day’s catch into a series of good looking fillets to toss on the campfire or frying pan later. This isn’t a bad knife, but it is on the budget side of things, and that means it’s not going to be perfect. While this knife is still quite highly rated there is a common complaint that does seem to come up in quite a few reviews. The most common complaint by far with this knife is that the edge tends to be weaker. Many people report needing to sharpen this knife consistently, especially right out of the factory. The Meyerco fish fillet knife pair is one of the more highly rated budget options when it comes to cheap fillet knives that can be sharpened and get the job does when it comes to cutting through the day’s catch. 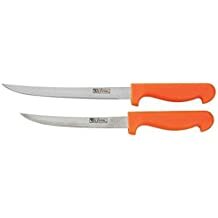 This pair of fillet knives is made from 420 stainless steel blades and composite material handles that make them strong while offering a firm grip. There are two main sizes, each with a 4.75 inch long handle and then with a 5.25 inch blade or a 6.5 inch blade, giving you options when it comes to picking out the best need for your situation. These knives come with clear protective sleeves that work as basic plastic sheathes, although you will probably want to eventually look for an upgrade in the fillet knife sheath department. These Meyerco knives have a limited lifetime warranty and while they can be a good inexpensive option, if budget isn’t an issue there are better choices on this list. However if you need some workable knives for around the price of a $10 bill then these are near the top when it comes to inexpensive fillet knife options. Seems appropriate that the Rapala name would have one of the top premium fillet knife options for anglers as well as one of the better high quality inexpensive options. The third of three Rapala knives on this list of the best fillet knives for anglers, this is still a high quality fillet knife that is quite highly regarded. The Superflex style of Fish n Fillet knives from Rapala features an especially thin blade that is built for flexibility and offering the angler more control while cutting. 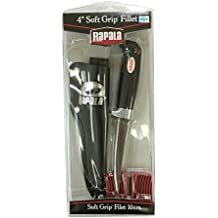 These stainless steel blades are further treated with Rapala’s specialty non-stick coating to make it much easier to slice a clean cut that then makes it easy to take individual fillets off from the skinned fish. In addition to the solid blade there’s a good looking wood handle complete with logo design and a polished brass ferrule that really brings home a beautiful aesthetic appearance that most anglers and fans of the Rapala brand will absolutely love. The sheath is tooled leather, which adds to the overall appearance and indicates an old school functionality. Available with blade sizes of 4 inches, 6 inches, or 7.5 inches. 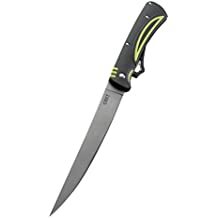 This well thought of knife is the perfect way for us to end this list of top rated fishing knives. One of the first things you need to consider before buying the right fillet knife (or knives) for you is the species of fish you are most likely to fish for. Cleaning up the catch after a successful day of trout fishing is going to be a lot different than preparing a pan of sunfish, or gutting a big catch after a day of carp fishing. The reason for this is that the size of the fish often goes hand in hand with how long a blade you want on your fillet knife. While blades can vary from 4 inches to 9 inches, there are several standard sizes that you will see quite often like 4, 6, 7.5 and 9. In addition to this, quality is a big deal. What is the handle made of? How good is the metal that makes the blade? Is the design likely to hold up over time or is it going to struggle? Do you need a specialty blade like a folding fillet knife or an electric model? These are important things to consider before looking for your ideal fillet knife. The better the blade, the longer it keeps an edge, the happier you will be with its long-term performance. If you fish for many different species of fish then you will want to strongly consider getting more than one size of fillet knife that way you’re prepared for whatever ends up on the hook side of your line. Good fillet knives for fishermen are a unique design since they are built for a very specific purpose as opposed to general use. A good fillet knife isn’t just about the quality of steel but it needs to have a decent amount of flexibility to allow for the proper movement around the ribs. The edge of the knife refers to its sharpness. The sharper the blade the smoother the cut. If you want to cut down on accidents, speed up the fish cleaning process, and end up with the best possible fillets from a day’s catch then you definitely want to go with a knife that has a reputation for being sharp and staying sharp. These are not the same thing! This is important to note because you want a knife that is going to meet all of your fish cutting needs while out on the lake or on that adventurous fishing trip. 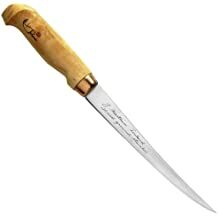 A fillet knife is a very flexible boning knife that is designed specifically to filet and prepare fish. While often mentioned as a kitchen knife, any good angler knows the importance of having one with a sheath for all your outdoor fishing adventures. The special thinness and shape of a blade on a fillet knife gives an angler the maximum amount of movement and versatility to remove skin, cut around the ribs, and cleanly cut the fillets of meat away from the rest. Q: What sizes do fillet knives come in? A: While fillet knives can come in any size with blades from 4 inches to 9 inches in length, generally speaking the four most common sizes will be 4 inches, 6 inches, 7.5 inches, and 9 inches. You will be pretty well covered if you have one of each size, and with some research you can find blade lengths at 6.5 inches, 7 inches, and 8 inches without too much extra effort. Q: What size fillet knife should I purchase? A: This depends on which type of fish you are going to spend the most time going after while fishing. Smaller fish means smaller blades while going after larger fish means you will need a bigger blade on your fishing knife. Q: Is there a big difference between basic fillet knives and premium ones? Q: What type of sheath should I use to store my knife? A: Most fillet knives will come with a sheath. Some will be high quality leather (a personal favorite of mine) while many others will be made from plastic, and the plastic sheaths for these fishing knives can vary immensely in overall quality. Q: How can I make sure my fillet knife is a good one? A: There are a few ways to definitely tilt the scales in your favor with this one. There are some names in the outdoor industry that have a reputation for being premium, high end, or simply a little bit better than the rest when it comes to quality. Going with one of these names is always a good way to go. Another thing to look at are the online reviews that are verified from experienced outdoorsmen. Are there names that keep coming up as a positive? Do some names come out as being not consistently as good? Keep track of all this information to separate the wheat from the chaff. Q: How many types of fillet knives are there? A: While this common question is a bit ambiguous, generally speaking there are three types of fillet knives of note. One is the classic model or design, another is the folding fillet knife, and a third is the electric fillet knife. Generally speaking, we never recommend the third because more efficient cuts can always be made by hand, even if it takes a bit longer. Fishing is a hell of a lot more fun when you have an amazing knife that slices around the ribs and other bones cleanly with no issue, because there’s nothing like freshly fried fish after you have cleanly, quickly, and successfully created a fillet that is ready for batter and frying or butter, dill, chives, and an aluminum foil wrapping. I have many great memories of some delicious fish just out of the lake, and there’s no question that a sharp fillet knife that allowed quality cutting really makes all the difference for leaving you with clean boneless fillets that are easier to enjoy – and that makes a huge difference when it comes to that overall experience. Don’t settle for mediocre fillet knives. Make sure you have one that holds up to the test of time today!